For Obama, Gruber has become an Other from another mother. Finally, the right wing has found what Susan Rice was to Benghazi and Lois Lerner was to the IRS, but better—a human face to represent all that they believe is deceitful, illegitimate and downright evil about Obamacare and, indeed, about the entire last six years. This bill was written in a tortured way to make sure CBO [Congressional Budget Office] did not score the mandate as taxes. If CBO scored the mandate as taxes, the bill dies. Okay? So it’s written to do that. In terms of risk-rated subsidies, if you had a law which said healthy people are gonna pay in—if it made explicit that healthy people are gonna pay in and sick people get money, it would not have passed. Okay—just like the—people—transparen—lack of transparency is a huge political advantage. And basically, call it the stupidity of the American voter or whatever, but basically that was really, really critical to get anything to pass. “What happens to Obamacare now that we’ve all been called stupid?” Fox News’s Bill Hemmer asked this morning, practically licking his chops. In case there’s any doubt that Gruber is Fox’s most useful villain since the Rev. Jeremiah Wright, Politifact found that Fox mentioned Gruber at least 779 times between November 10 and November 18 (MSNBC clocked in seventy-nine instances and CNN just twenty-seven in the same period). Democrats like Nancy Pelosi have only made things worse by trying to distance themselves from Gruber, even though tapes show they knew and respected his work in the past. 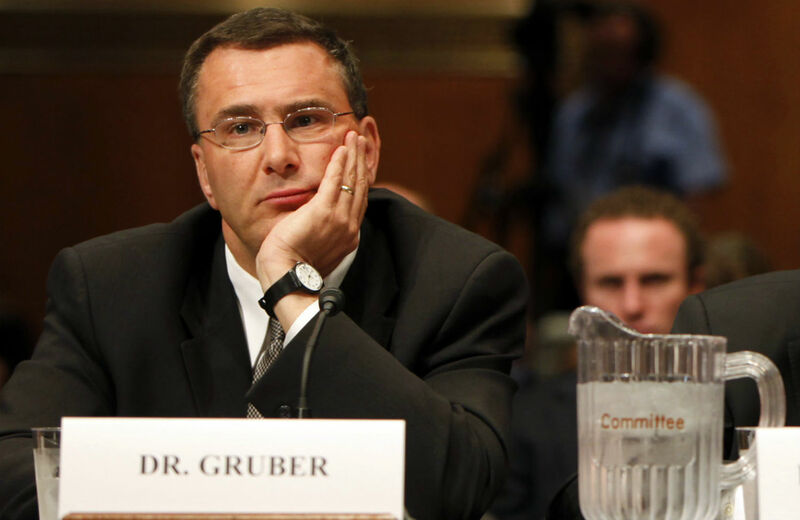 Surely for most of the Republican base, the stereotype Gruber evokes is more benign. Gruber, says Jon Stewart, is a “super egghead” nerd, what with the academic background, the eyeglasses, and, in Stewart’s estimation, the “pinched nasal tone.” He ran a clip of Eddie Deezen, the actor specializing in nerds, and discovered that his voice is uncannily like Gruber’s. Republicans are calling for, what else, congressional hearings. But like the IRS and Benghazi “scandals” and most things the GOP deems hearings-worthy, “Grubergate” is mostly hot air and bubbles. If you look behind his braggadocio and the media’s outrage, Gruber wasn’t really saying anything we didn’t already know about how health insurance works (healthy people subsidize sick people; that’s the nature of insurance) or how legislation is written (it ain’t pretty, and never was). Here is where media reports have most badly bungled Gruber’s point. They have treated his line about transparency as if he were describing the entire process of writing and passing the law. ….But Gruber was not talking about passing the law in a non-transparent fashion. Conservatives believe the law was passed non-transparently, but nobody who supported it considers this anything but a bizarre description of one of the most drawn-out public and legislative debates in the history of Congress. Gruber was surely referring to the non-transparent mechanism of regulating insurance companies, causing them to charge less to the sick and more to the healthy, without Congress having to carry out those transfers through direct taxes…. It’s a feast for critics of Obamacare who suddenly are saying, you know, “Oh, this is why we are upset.” Look, are you kidding me? In Washington, we package, we merchandise just like Procter & Gamble and anybody else that’s selling soap…. In fact, I would say it’s much ado about nothing with Gruber except that the critics of Obamacare are having a field day. The act is working. The uninsured rate in the country has dropped by 25 percent. This is something that Republicans should be celebrating. We have more competition. We’ve done away with the Medicare doughnut hole. We have no lifetime caps and limits, we have no conditions about preexisting illnesses, we have preventative medicine. It’s just incredible to me, though, Republicans persist. There is, however, one thing Gruber said that could have real consequences. In another video, he seems to say the ACA subsidies are meant only for people enrolled in state exchanges, not for those in the thirty-six states that allow only the federal exchange. But, as Sarah Kliff at Vox explains, “Gruber has since said he spoke “off-the-cuff” and made a mistake. And there’s reason to believe him: Gruber spoke regularly to dozens of reporters during this period, and never mentioned this idea to any of them, and his modeling software always assumed that federal exchanges could use subsidies.” In what amounts to a typo, one clause in the ACA itself also seems to make this mistake, in contradiction to the rest of the entire bill. But it was enough for the Roberts Supreme Court to take up the case, King v. Burwell, which could destroy Obamacare, with or without help from Gruber’s misspeaking tongue. As usual, the GOP’s persistence is paying off. Gallup released a poll on Monday showing that approval of Obamacare hit a “new numerical low,” of 37 percent. Makes sense. With all the bad press over Obamacare since 2009, and now with Grubergate, reality—you know, real people’s real experiences—is often surprising.